Our range of products include air filters, pre - filters, fine filters, pocket filters and roll-o-matic filters. We have marked our prominence in the market by offering high-quality Air Filters to our valuable clients. These filters are used to keep the required area free from germs and other pollutants. The provided filters are available in box type and flange type to meet the diverse requirements of the clients. They are designed with utmost precision by using superior grade raw material and latest technology to meet the industrial standards. In addition, we are offering these a nominal price. Our quality range of air filters in box type and flange type air filters made by using different type of filter medias depends on micron rating. Our range can be designed for high performance efficiency 99% down to 1 microns. Application : Generally used in air handling unit, HVAC systems, Intake system for blower, Compressor, Generator& other systems. Media : HDPE, Synthetic, Glass fiber, Metalic mesh & different combination of media. Note : We will Manufacture Filters as per customer's requirements. Choose from our premium quality range of Fine Filters designed to meet the increasing demand of our clients. 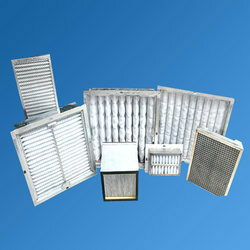 These filters are extensively used in air handling unit, air conditioning, suction filter in FBD, compressor, generator, etc. They are available in different sizes and media like HDPE, synthetic, spun-bonded, and Glass fibre. The offered filters are designed under the supervision of our adroit professionals to meet the latest industrial norms. Moreover, we are offering these to our esteemed customers at rock bottom price. Application : Generally used in air handling unit, Air conditioning, Suction filter in FBD, Intake system for blower, Compressor, Generator & other systems. Media : HDPE, Synthetic, Spun bonded, Glass fiber, Metalic mesh & different combination of media. Application : Used in Air Handling unit, Air ventilation systems, Paint booth & other systems. Media : HDPE, Synthetic non woven & other depanding on application. 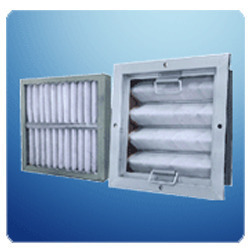 These filters are use for high dust holding capacity. With our immense domain expertise, we are engaged in providing an excellent array of Roll-o-Matic Filters. Designed with perfection; these filters comes with Glass Fibre media, which is automatically fed into the air stream and then re-rolled after it has accumulated ample amount of dust. They are used as a pre-filter for plant room equipment and duct linings thereby extending the installed life of secondary filters. Further, we offer these filters to our esteemed clients at nominal rates.